Mullins and Muñoz at UM Commencement 2018. 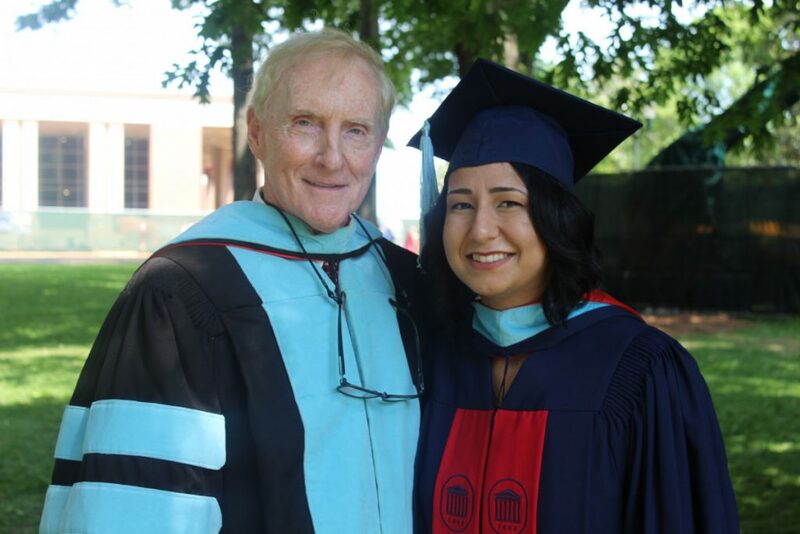 Jessica Muñoz, a 2018 graduate of the University of Mississippi, is the third recipient of the Andrew P. Mullins Jr. Mississippi Teacher Corps Alumni Scholarship. The award, which is designed to support Teacher Corps alumni who wish to pursue advanced graduate study at UM, will provide $2,000 in financial support for Muñoz, who will begin her Ph.D. studies in Spanish at UM this fall. The award was endowed at UM in 2016 by Teacher Corps Co-Founder Andrew P. Mullins Jr. The endowed scholarship is available to Teacher Corps alumni and may be awarded twice to individuals. Recipients may pursue an advanced degree in any field of their choosing on UM’s Oxford campus. The inaugural recipients of the scholarship award were husband-and-wife Derek and Kelly King, who first received the award in 2016. Throughout her time in the Teacher Corps, Muñoz taught in Panola County, first as a science teacher at North Panola Junior High School and then as a Spanish teacher at South Panola High School. A graduate of Willamette University in Salem, Oregon, she earned a bachelor’s degree in environmental science and Spanish before joining the Teacher Corps in 2016—a move that literally took her across the country to north Mississippi, sight unseen. Founded in 1989, the Teacher Corps is an alternate-route teaching program that has placed more than 725 new teachers in critical-needs school districts throughout the state. The program is highly competitive and has attracted recruits from 239 colleges and universities around the country. All participants receive job placement and two years of funding to earn a Master of Arts in Teaching degree from UM. More than half of its alumni are still in education in some way. The program is currently training its 29th cohort at its training school at Holly Springs High School, where incoming participants are trained by program alumni before entering the classroom. Muñoz is currently spending her summer working as a teacher as part of UM’s Rebel Quest day camps, which provide summer learning for elementary-aged children. In the fall, she will teach undergraduate Spanish courses at UM as part of her graduate assistantship. She hopes to finish her doctorate in five years and plans to stay in education in some way following graduation.